January 24, 2018 - Dabur Herbal Neem Mouthwash, is enriched with neem, and clove oil extracts, and has antibacterial properties. It is extremely effective in fighting germs – thus improving the health of teeth and gums, in addition to providing long-lasting fresh breath. Dabur Herbal Lime Mouthwash, on the other hand, has a powerful lime content that cleanses and whitens teeth to ensure long-lasting freshness. Dabur herbal mouthwashes are specifically formulated to fight bad odor-causing bacteria with their anti-bacterial and anti-microbial properties. In addition, they have natural mouth fresheners and the cleansing properties of lemon help remove the bacteria present in plaque and in the lining of the gum. 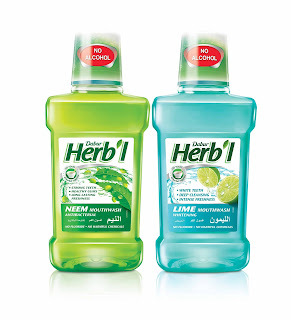 The Dabur Neem and Lime mouthwashes are available in 250ml bottles, at AED 10 each.